I am watching the developments within the Catholic Church with intense interest these days. While I am decidedly Protestant—by upbringing, church attendance, reading through the years, understanding of church history—I believe Christians everywhere should be pulling for the Catholic Church to be strong and vibrant and effective. We have our differences, to be sure. When Catholics claim all apostolic teaching runs through the ages directly to the pope, I wince and hope for more openness. But I believe we are in a time, as Christians are pushed more forcefully to the margins of influence by our post-Christian culture, when we all need to lock arms for the cause of Jesus Christ and his plan of human flourishing for our damaged world. There is no small measure of urgency to this daunting task. We all need the Catholic Church. 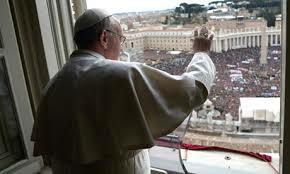 The Catholic Church needs strong and unified Protestant encouragement and support. One prominent fundamentalist warns Protestants not to get too giddy over all of this process with the pope. After all there were legitimate reasons for the Reformation, not the least of which is continuing heresy. On the other end, the liberal wing of both Catholicism and Protestantism, including the secular press, desperately wants a radical pope to abandon the teachings of the Church: Discard the Church’s ancient teachings on marriage, set aside its compelling position on the sanctity of life—in other words, accommodate to the way of secular culture and then we might show some respect. But there is another more important way to look at this selection of the Pope. For years we watched the great Pope John Paul II, with sadness, and yet with deepening respect, shuffle his way toward the end of his journey. I shared with so many across the world huge admiration for the transformative witness of John Paul II. The hunched-over Pope became in the end one of the most powerful symbols for our time. Maybe the church, maybe all Christians, maybe the world needed just this very embodiment of humility. This was the word of the cross walking across the broad stage of our world. It was the word of humility, of self-sacrifice, self-giving. The word of the cross, as we find in Jesus Christ, is perhaps the most important message for our age of individual self-aggrandizement and institutional triumphalism. The Apostle Paul knew from the beginning that the word of the cross is always, as he says, a scandal to the Jews and foolishness to the Greeks. Humility is never an easy sell, perhaps especially in our own day. We do not want the Catholic Church to be weak. We are deeply pained with the discovery of abuse among the priesthood and apparent divisiveness in the inner halls of Vatican leadership. The Church has been brought to its knees. But perhaps, out of the humility modeled by Pope John Paul II, perhaps as well in the resignation of Pope Benedict XVI, the stage is set for new awakening for the Church, with the word of the cross at the center of something fresh and exciting. We truly hope the Catholic Church has made such a choice in Pope Francis. The early signs look promising. If this profound “friendship with Jesus Christ” is at the center of the mission, the Church will find new influence. Perhaps we can tip the tide of deepening secularism. If we are committed once again, winsomely and yet firmly, “to make robust orthodoxy exciting,” perhaps the world can find another starting point for thought, to quote the great Lesslie Newbigin. The center must hold firm and vibrant and articulate. Then, from these profound centering commitments, we move out into the world, with humble yet confident stature, carrying the word of the cross of Jesus, out into the world to bring a true vision of human flourishing. All of this is why we watch the Catholic Church with such interest and hope and yearning. We surely must lock arms, in the name of “friendship with Jesus Christ,” with exciting, robust orthodoxy guiding the way, surely this is the path toward a better world. Thank you, Phil, for articulating so well what we are thinking and feeling. My hope is that church leadership will form a new partnership with educational leadership to proclaim the Christian Gospel as it needs to be told. Our culture is much more likely to hear higher education than it is to hear the church. What if we spoke together as one?